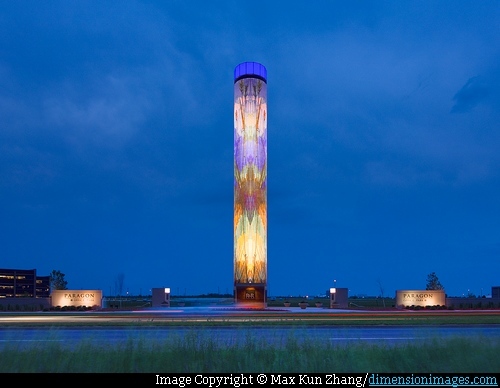 In the midst of what was once the American prairie land, stands a unique, 120 feet (~36.6 metres) high shimmering glass mural made from 1.8 million Italian glass tiles. 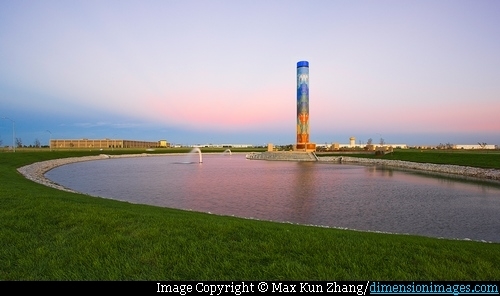 Known as Paragon Prairie Tower it is located in small town of Urbandale, a suburb of Des Moines, Iowa and is a gift to the town by R&R Realty Group. 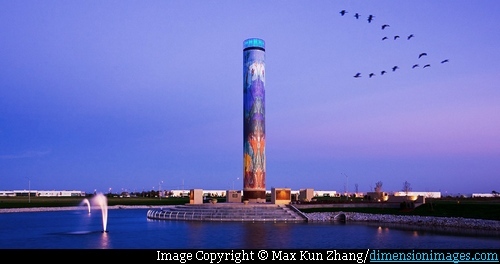 Dedicated in September 2007 it is reportedly the largest Italian glass mosaic tile mural in the Americas. The 16 feet (~4.9 metres) diameter 5,000 sq feet (~465 sq. 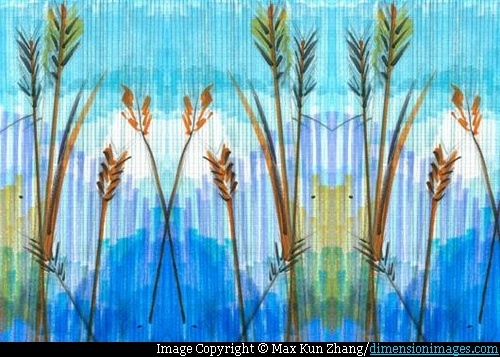 metres) cylindrical mural depicts the almost lost prairie of the area - blue stem tall grass, wildflowers, coneflowers, black-eyed susans, daisies and clovers. It is also a tribute to the agricultural structures such as grain silos which once stood in the area known as granary of the mid-west USA. 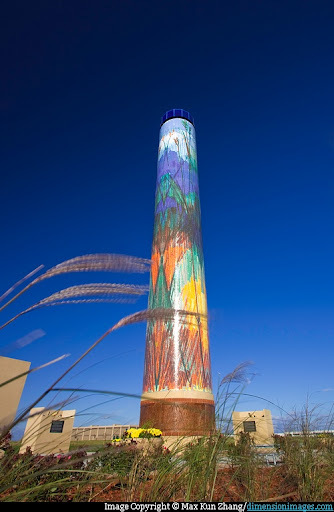 Designed by David B. Dahlquist/RDG Dahlquist Art Studio the glass mural tower is brain child of Daniel Rupprecht of R&R Realty Group. 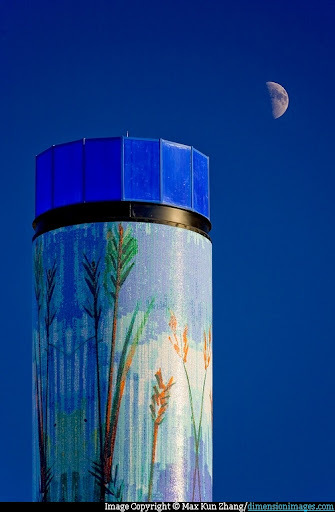 The base of the tower has a copper coloured frieze of prairie grass in terracotta relief and the cylindrical mural is topped with blue band of illuminated glass like a beacon. 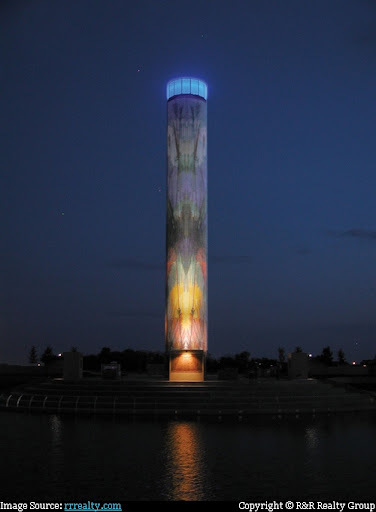 Set in a plaza surrounded by a artificially created lake, the tower is fully illuminated in the night which enhances the colourful beauty of the breathtaking glass mural. There are four large storyboard plaques around the tower detailing the concept of the tower. Credits: I am thankful to Paul Rupprecht/R&R Realty and Max Kun Zhang /dimensionimages.com for allowing me use of images from their website/ collection. 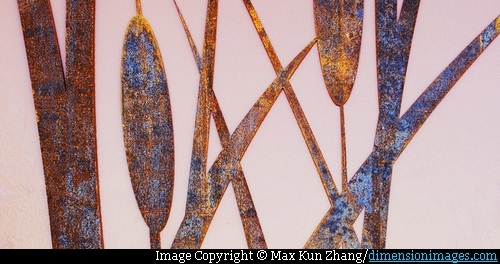 Besides giving me permission to use his images, Max Kun Zhang has also sent me some fantastic images from his collection which have given a colourful zest to this post. Thank you Max.